On the 12th March, 2015, my literary hero, Sir Terry Pratchett succumbed to the Alzheimers which had been slowly leeching his life away since his first diagnosis some years earlier. I honestly believed; as I’m sure so many others did, that Sir Terry would be around for a lot longer. I dreaded the day he would no longer be able to write. The idea of him actually dying was something I couldn’t really get to grips with and six months on, I’m still mourning his loss. My first foray into Discworld was around the age of 16. My dad, always a keen supporter of our local library, one day brought home The Colour of Magic. Unable to get on with the writing style, the book was passed to me and so, a new Pratchett fan was born. It was 1989, the year Pyramids and Guards! Guards! were published. I had a lot to catch up on. I’ve always loved how Sir Terry could take a modern world phenomenon, event or catastrophe and adapt a story to it. Parodying anything and everything from football (Unseen Academicals) to the movies (Moving Pictures) opera music (Maskerade) and even the discovery of a new country (The Last Continent). His characters represent so many aspects of the human psyche, cleverly disguised as witches, wizards, money men, police, Igors, Golems; even that monstrously clever dictator of Ankh-Morpork Lord Vetinari, but the writing is so sublime that the parallels are subtle. Sir Terry was able to provide a viewpoint without ramming it down the reader’s throat. 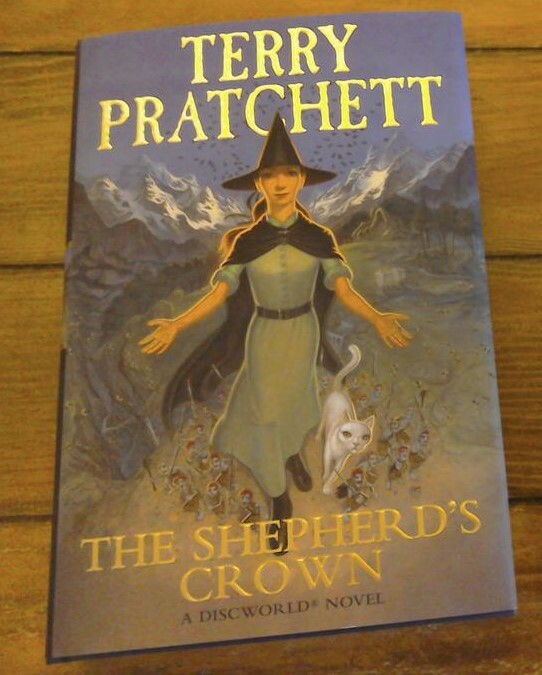 Yesterday, my copy of the Shepherd’s Crown arrived in the post. 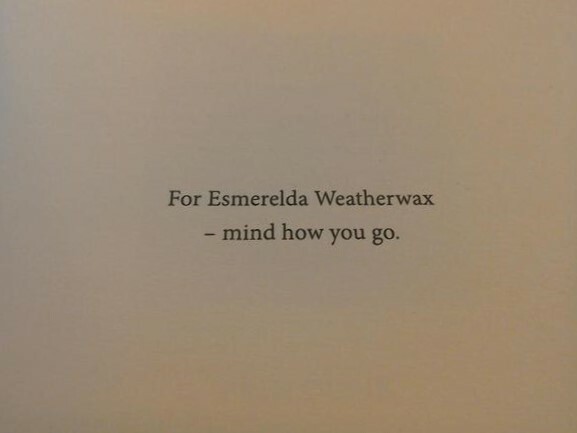 A new Pratchett always used to be an exciting time for me, I behold his books with such reverence that to finally have the very last book caused tears to spring forth and by the time I read the dedication, I was a mess. Writing this now brings a lump to my throat. I’ve never been one for things like conventions and fandom get togethers but now I really do wish I’d gone to at least one to connect with other fans who love Sir Terry as much as I do. I was very lucky to meet him once, at a book signing in my old hometown Southampton. The bookshop itself no longer exists but after queuing for hours, down the stairs he came. Dressed in a safari suit and minus his now famous hat, Sir Terry was smaller than I imagined but exuded oodles of personality, was well spoken and articulate. He reminded me of a dotty professor type from some dusty university somewhere and probably would have fit in very well at Unseen University itself. “Grace, the Turtle moves!” he wrote and signed “Terry Pratchett” with a flourish. I must admit to being rather shy and speechless at the signing, pausing only to speak my name whereas others were engaging him in conversation and getting him to sign not only books but Discworld mementos, figurines and suchlike. And so it is now, that with the last ever Discworld offering in my hands that I embark on the final story and say goodbye to so many beloved characters. I cannot name them all but if it weren’t for Rincewind, the Luggage, Granny Weatherwax, Nanny Ogg, Sam Vimes, Death, Captain Carrot, Lord Vetinari, Tiffany Aching as well as non-Discworld characters such as Johnny, Maurice, Dodger and Mau I would have missed out on an incredible journey that has enriched my life and taken me to places I could never otherwise visit. For that, I only have one thing left to say. Eek, my first blog post!